Join us as we travel to the Mediterranean and paint the beautiful symbol of peace and plenty. We are teaming up with Glens Falls Sip and Canvas for this event which features a little slice of Italy, including : A 2 hour painting session, cash bar, gourmet appetizers as well as a private olive oil and balsamic tasting. Bring your appetite and imagination for a fun filled night! RESERVE YOUR TICKET NOW. THIS EVENT IS SURE TO SELL OUT!! This event is FREE!! 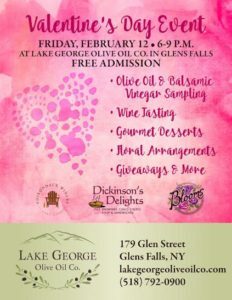 We invite you to join us for a night of sampling our delicious oils and balsamics while you sample wine from Adirondack Winery and desserts from Dickinson’s Delights.Blooms Floral designers will also be on hand to display their beautiful arrangements just in time for Valentine’s Day!! There will be free giveaways and specials all night. We hope to see you there!